Good morning! Today I’m sharing our 2016-2017 2nd Grade homeschool curriculum with you. I think this year is going to be really fun and I’ll tell you all about it in the video! 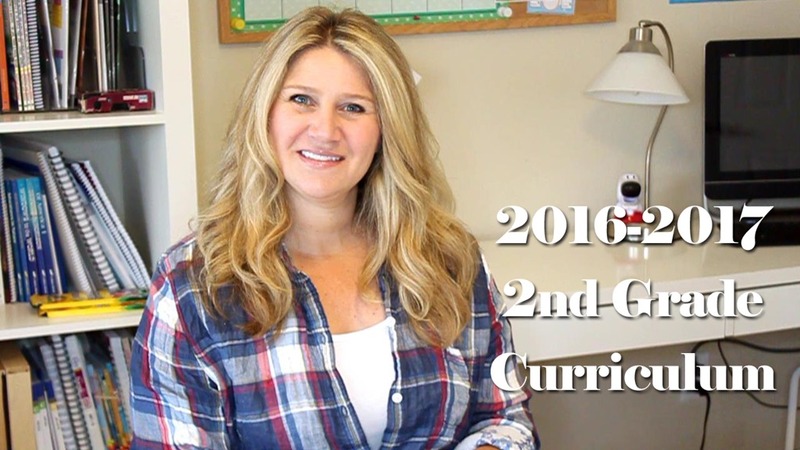 So to see what my 2nd grader will be doing this year watch our 2016-2017 2nd Grade Homeschool Curriculum video here! Science: Abeka maybe a scientist unit if we can fit it in! Language Arts – We of course do this at home as well, but I’m finding that it’s a nice supplement to what we’re doing. And that’s it for our 2nd grade curriculum line up this year! I’ll try to do a mid-year update to let you all know how it’s going. We’re trying some new curriculum this year, so that’s always exciting! I’ve done it both ways, I think it just depends on what works best for your child. For a couple of mine, doing all of the lessons first didn’t work as well because they’d forget what they were supposed to do by the time they got to the worksheets. So in that case I would just teach them first, then have them do the independent work, teach another subject, do the work, etc. Unfortunately with Abeka and you having a 1st and 4th grader, they’re far enough apart that I think lessons for 4th would be way too hard for your 1st grader. You’ll either have to do separate books like you ordered, or find something else to do that’s more suited for group work. My Expedition Earth and Road Trip are great for combining grades together which definitely makes life easier! Have you simplified your homeschool curriculum choices? I feel like previous years, you kind of went in between a couple different books with each subject. Yes, we did simplify it a bit more this year just out of need. We have a lot going on and I really needed something I could just open and go without a lot of planning. I will say that Abeka isn’t my fave for science or history, but it’s definitely less planning. They do have a TON of quizzes, worksheets, and tests. So we are learning to skip some of the extra busy work just because it’s more meant for a classroom. Hi Erica!! For your spelling curriculum, does spelling you see teach the “rules” about spelling like All about spelling? Or is it Spelling you see mainly geared towards copy work? Thanks for your help! No, SYS doesn’t teach phonics rules, they have a bit different philosophy. You can read about it on their website. But mainly they believe that through repetition in reading a text, copywork, and dictation, students will learn the correct spelling of words. hello I was wondering if your unit studies would be applicable for the great illustrated classics versions? I know you use classic starts but we just read Heidi and I was wondering if you knew if it would be similar? I’m assuming that the Illustrated versions would have different chapters in them. So while you may be able to adjust the lapbook to fit the other version, it won’t go with it directly. Hi Erica …thank you so much for all this info…so helpful…and glad you are so ahead to be in the year 2106! hee hee! Seriously though…love the info and ideas!! You mentioned that your still doing spelling lists along with spelling u see. Which curruliculm are you using for spelling lists? Hi Erica! I love your videos! Thank you for taking the time to give us info on your curriculum choices it really helps. How can I find out if my school district has a program like the one you take your kids to? You should just be able to call your local school district and ask if they have an options program for homeschoolers. How do you feel about IEW for the younger years like 1st and 2nd? Their primary level? I haven’t used their primary resources, so I can’t comment too much, but that would be a great question for the COAH Community. I’m sure someone out there has used it! It also looks like the only have a Primary Language type curriculum, and combine that with All About Spelling curriculum which we’ve used and love. Hey Erica! Thank you for always being so helpful and encouraging in your posts…somedays I really need that! I wanted to ask you if you’ve ever tried teaching only science for half the school year, and then the history the other half of the school year? I have a friend that teaches 3rd grade and that’s what she does…seems easier for my mind, but just wondering if you’ve ever tried that. Thank you!